Fun, friendly, and vibrant, these ceramic ornaments will catch anyone’s eye. Inspire the child within with these adorable faces and candy-like patterns. 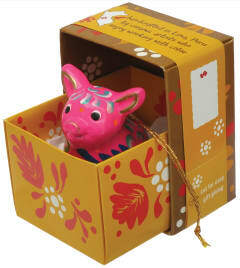 Handmade in Lima, Peru, these spiffy, little animals will find loving homes in no time! You can learn more about the process it takes to create these ornaments on our blog or watch Edwin in action while he creates our goat ornament.